In the early days, when MIDI standardization was in the beginning, midi pads were reserved only for professional musicians and producers who wanted to spice up things with a few electronics. Four decades later, MIDI instruments and other devices are an essential piece of equipment for everyone who wants to make music. Thanks to the rapid technological progress, these devices aren’t as expensive as before and can be found in every home studio. One of these devices is MIDI drum pads. These are great pieces of gear that you could use to get some kind of a natural extension on your live performances. On the other side, it is a perfect studio tool, which will help you a lot in producing new tracks. The main purpose of these pads is to create drum lines. However, since they use MIDI, you can map them to whatever purpose you wish on your music production software. Please note, if you’re looking for a standalone sample pad that acts as its own separate instrument, then you should check out our popular article on electronic drum pads. Sample pads are generally MIDI-enabled, so they can perform the same features as MIDI drum pads. What Should You Look When Choosing MIDI Drum Pads? There are few things you should keep in mind when choosing MIDI drum pads. Think about your needs. What size drum pads do you need? Do you want extra knobs and controls for effects? What is your budget? Another important thing to consider what software or hardware you’re going to use this MIDI drum pad with. Though MIDI is compatible with all good music production software, so there’s not much to worry about here. Also, consider things like size and weight. If you want to carry your device from place to place, it should be small enough to fit your bag, not to mention that heavy pads could be pretty inconvenient. Think of power supply as well. 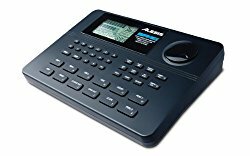 Fortunately, compact MIDI drum pads are usually operated with a USB port, which is a huge benefit for someone who is in a constant move. Finally, find a piece that guarantees good playing dynamics. Pads must be sensitive to velocity if you want to express yourself in a proper way. This is an entry-level model from Akai Professional. Thought budget products from renowned manufacturers can often be overpriced, this one definitely offers a lot of value for the money. After all, it is probably the most popular midi drum pad around. Besides affordable price, the strong points of this device are good overall quality, transparent controls and easiness of use. Though a pretty small pad, it offers a pretty decent number of options. There are 16 pads that offer decent sensitivity, which is crucial for the dynamics of your playing. On the other side, the material of these pads is a real dust magnet, so count on frequent cleanings. A software is also included and it works amazing. It is pretty much the same version of the software that the company sells separately for hundreds of dollars, which sounds unbelievable. All in all, you definitely won’t make a mistake if you choose this one. This model represents the second generation of super-compact nanoPAD series. The evolution of this device lasts for a full decade and the new version comes with some significant upgrades, especially in hardware. This device now comes with 16 pads instead of 12, which was the case with the original model. On the other side, we didn’t see a lot of software upgrades. Moreover, the company left out a few functions, which would be a bit of disappointment to some. However, I’m pretty sure that you will hardly get anything better from other manufacturers, considering such an affordable price. 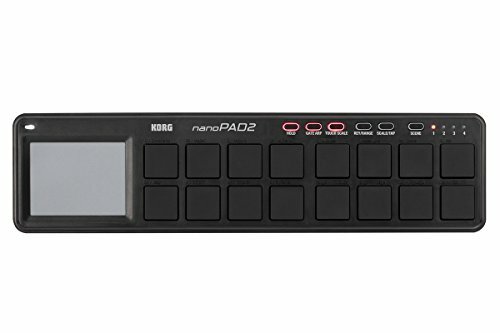 Considering all the pros and cons, I find this Korg nanoPAD2 Slim-Line a pretty good deal. 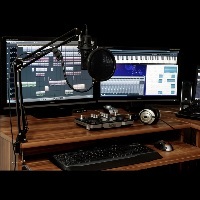 It is a perfect tool for your home studio, especially if you are a beginner and don’t want to spend hundreds of dollars to get some advanced features that you probably won’t use at all. Long story short – compact dimensions, great hardware quality, sensitive pads and basic, but reliable functions. 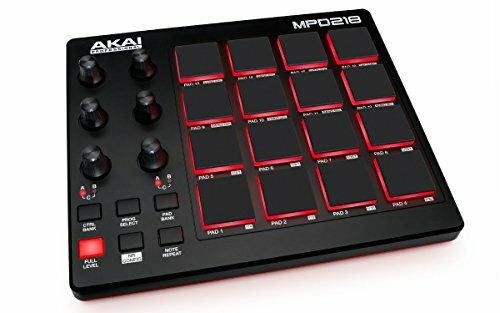 Akai also has a strong competitor in this segment of mini drum pads. Unlike Korg nanoPAD, this one comes with only 8 pads, which might seem inconvenient to some. On the other side, there are also 8 rotatable knobs which can be used for every software parameter. For those who prefer old-school analog controls, this is definitely a big advantage. Speaking of the hardware, the overall quality is pretty good. Pads feature excellent sensitive velocity, so you can count on plenty of dynamics. There are four programmed banks, while the device is USB powered, which makes this drum pad pretty portable. When it comes to disadvantages, someone would say that rotatable knobs are too small and that could’ve been designed better. Also, the pad is a real dust collector. Of course, we can agree that there are few things that could have been done better, but it seems unfair to consider these things as disadvantages at this price tag. I’m sure that you’ll be amazed by all the things that are packed in this quite compact unit. The evolution of “compact Machine” started ten years ago. The second-generation comes with a familiar appearance, though few revisions have been made. 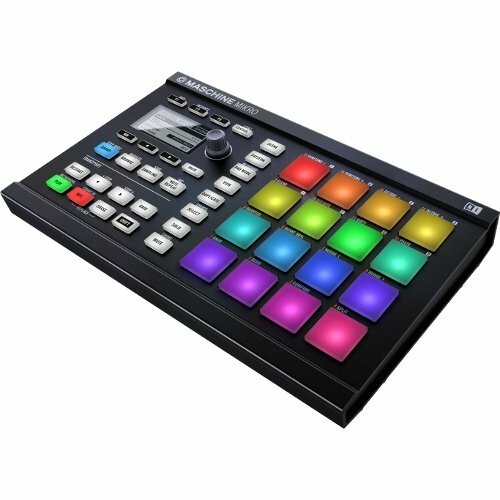 First of all, the Native Instruments Maschine Mikro MK2 is smaller than its predecessor. In order to make this unit as smaller as possible, there are no more two transparent screens that characterize the original model. This one comes with a single, though a little bigger, screen design. This will require a little bit more navigation than before, but I’m sure you’ll get used to it pretty quickly. There are 16 pads and all of them are characterized by an excellent response to both velocity and aftertouch. Besides excellent playability, they also come with fancy orange backlights. A hi-quality hardware is beneficial for sure, but the biggest trump of Native Instruments Maschine Mikro MK2 is software. It is compatible with various operating systems and works super-fast. Also, the software offers you the ability to host third-party plug-ins. In practice, this means countless editing options. 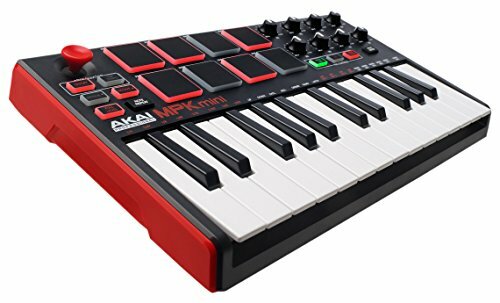 The Akai Professional MPK Mini MKII is one of the smallest all-in-one MIDI controllers that you can find around. 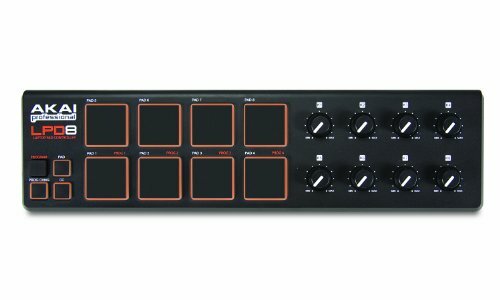 Unlike other products from the list that feature drum pads only, this one comes with a keyboard as well. The upper part of the unit is pretty much the same as Akai LPD8. There are 8 drum pads, as well as 8 rotatable knobs. The lower part of the device comes with a classic MIDI keyboard, as well as with the joystick which is positioned at the upper left corner. The unit is USB powered and it is compatible with various operating systems including Windows, Mac, and iOS. Super compact dimensions make this combo MIDI device a highly-portable unit. Definitely, a perfect tool for beginners, especially if we consider its highly-affordable price. It doesn’t matter if you’re just an amateur musician or an enthusiast who like to mix and create new tracks in a studio, this is definitely a piece of equipment you need to have. Benefits are numerous, for both musicians and producers. You can count on superior workflow, plenty of practicality and easiness of use. Above everything, you will have a better musical expression, expand your knowledge and probably become a better musician. MIDI drum pads don’t cost a fortune anymore. You can find a decent unit for less than a hundred dollars, so there is no reason why you shouldn’t try, even if your budget is tight.